At a time where furniture design is more focused on form than function, there is always a cult of rebellious designers who say “Screw that!” regarding the typical standards of the design trends. While it’s not a typically pretty piece, Luis Eslava’s Welcome Table is a brash rebellion against the tables of Ikea and other decor fitting home surfaces. Inspired from the hospitality of door step welcome mats, the Welcome Table invites your guest to make themselves at home, moving the floor mat to the table surface. Want to put your legs on the table? Don’t worry about being rude! This table is made for your rudeness! So rather than having your guests sit uncomfortable planted to their chair, the Welcome Mat is, well, pretty darn welcoming when compared with the cold design of traditional furniture. It feels so much more inviting to actually be encouraged to make yourself at home, rather than feeling like a rude nomad because your legs are hanging uncomfortably against the floor. 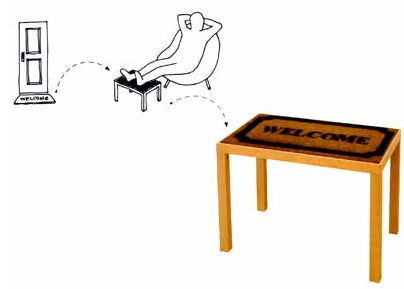 The Welcome Table is especially effective for those who own Swiss-made ergonomic chairs. The ones which require you to contort into awkward positions in order to be comfortable. If you’re willing to make your home more of a welcoming atmosphere, the Welcome Table could be for you. At least, if it ever hits the general market.